The 20 year old British commanding officer and 21 year old bomb aimer whose war graves are seen in the montage above were crew members of an RAF Lancaster shot down over occupied France while returning from a bombing raid on Milan in 1943. Five crew members parachuted from the stricken plane, but the young pilot and bomb aimer died in the crash. They are buried in the graveyard of the 13th century church in Vandenesse-en-Auxois. A few miles away above the village of Créancey is the commemorative plaque marking the spot where an American pilot died when his USAAF fighter crashed into the hillside during the liberation of France in September 1944. Fighting in western Europe had stopped in the first global conflict of the twentieth century at eleven o'clock on November 11th, 1918 following the signing of the World War 1 Armistice at Rethondes, France. This town lies to the north of the Burgundy region where the photos forming the montage above were taken by me this September. Britain's last surviving World War 1 veteran Harry Patch, who died in July 2009 aged 111, hated war and dismissed Nov. 11th commemorations as "show business". But Audre Lorde's words reminded me of the importance of making the past work for the future, rather than for the duplicitous purposes of our political leaders. To explore how the terrible lessons from the past can work for the future I found myself turning, as happens so often these days, from the jaded imagery of television to the more subtly nuanced language of music. Benjamin Britten's War Requiem is one of the greatest statements about the futility of war. But it was to another composer, albeit one influenced by Britten, that I turned. Jonathan Harvey's Passion and Resurrection was commissioned for performance as as a diocesan community celebration by local singers in Winchester cathedral in 1981. Texts from the Anglican Book of Common Prayer and from the Pashka (Easter) celebration of the Russian Orthodox Church frame extracts from two Medieval Benedictine church dramas, with the audience participating in the singing of two plainsong hymns. The influence of both Bach's Passions and Britten's Church Parables are evident in Passion and Resurrection. But, despite being written for largely amateur forces, the sung drama is much more about the future than the past. The 85 minute work progresses from simple chant settings to the radiant finale which evokes Messiaen and uses Jonathan Harvey's signature technique of symmetrical inversion with mirrored harmonies radiating from a central bass axis. 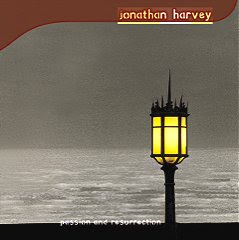 Jonathan Harvey is better known today for his Buddhist sympathies, but he says of the composition of Passion and Resurrection - 'That was a wonderful period and the mystical Christ remains with me very much to this day'. The excellent commercial recording of the work seen below was made by the BBC with Sinfonia 21 and the BBC Singers conducted by Martin Neary and is available on the enterprising Sargasso label. On a day when we must focus on making the past work for the future my links point to the Dresden Requiem for eleven young victims of allied bombing, and an icon in the restored Kaiser Wilhelm Memorial Church in Berlin, the Madonna of Stalingrad. * The white poppy symbolises the belief that there are better ways to resolve conflicts than killing strangers. Read more here. 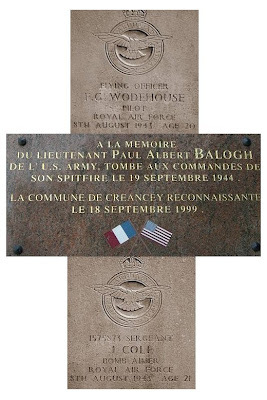 The plaque at Créancey says they the USAAF pilot killed in the crash was flying a Spitfire. I was not aware that the American airforce flew Spitfires. But a search on the internet confirms that the British supplied a limited number of Spitfires to the USAAF for use in the European and Mediterranenan theatres of war. Which explains the presence of one in central France in 1944. Hello! I am hoping that you might be able to help me. The photo of the plaque of Lt. Paul Balough is actually the grandfather of my boyfriend. We are traveling to France in March of this year and plan to visit Creancey. Are you able to provide us with any more information regarding the exact location of the plaque? Thank you. LaDonna, please post a comment with your email address so I can contact you. Your email address will not appear on the blog; I will intercept it during the moderation process.